Our spring mixed exhibition features new work by Suzie MacKenzie, Jenny McLaren and several of our artists. We continue to show prints by Karólína Lárusdóttir and have one of the best selections of available prints by Karólína in the country which can be viewed here. 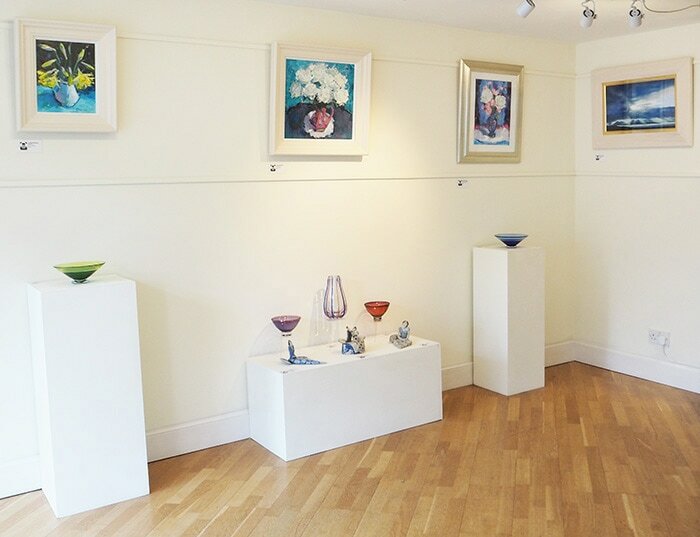 Paintings, drawings and original lithographs mostly inspired by local landscapes of the Black Isle. Oil paintings and woodcut prints inspired by the birds of our coasts and wetlands by Robert Greenhalf SWLA with hand-carved birds by Mike Lythgoe. The Castle Gallery is situated in the lee of Inverness Castle. The building dates to the early 18th century and has been sympathetically restored to provide an ideal gallery space on two floors with exhibitions of original contemporary fine and applied art by artists from Scotland and throughout Britain. A close relationship with our artists ensures the finest possible selection of works from both established artists and emerging talent. Tha Gailearaidh a' Chaisteil suidhichte ri fasgadh Caisteal Inbhir Nis ann an togalach eachdraidheil a chaidh ath-nuadhachadh na bhroinn gus sàr ionad taisbeanaidh a chruthachadh air dà làr le taisbeanaidhean nuadh ealain fhìnealta is fheumail gun samhail le luchd-ealain a tha ag obair an Alba fhèin agus air feadh Bhreatainn. ’S e an dlùth-chàirdeas eadar a’ Ghailearaidh agus an luchd-ealain stèidhte aice a chuireas far comhair an taghadh as fheàrr ’s as fharsainge de dh’obair an dà chuid feadhainn ainmeil agus feadhainn sgileil a tha fhathast a’ cosnadh an cliù.